Posted on Wed, Mar 14, 2012 : 10:25 p.m.
Willow Run's Kareem Lovelace Jr., center, and McKenzie Dunlap (3) fight for a rebound against River Rouge's Robert Metcalf, left, and Devonte Johnson. Going into a Class C regional final game against River Rouge, Willow Run High school boys basketball coach Anthony Davis told his team that limiting second chance opportunities would be a must. It proved easier said than done. 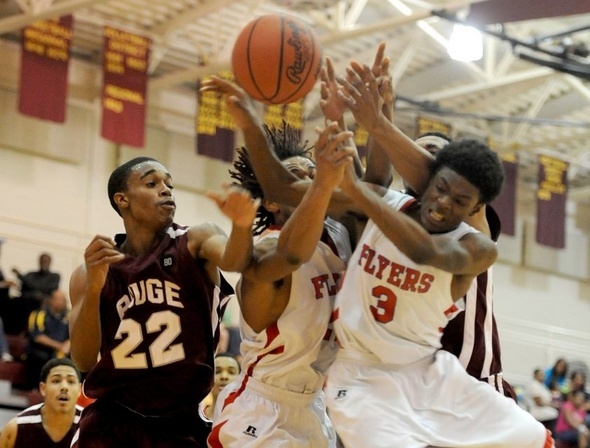 Willow Run couldn’t match River Rouge's size inside in a 53-26 loss on Wednesday night at Manchester High School. The biggest factor on the glass may have been the absence of Willow Run's 6-7 sophomore Jamal Poplar. Poplar only played 13 minutes because of foul trouble and finished the game with just two points and six rebounds. “It was a big factor, (but) I’m not going to make excuses off that,” said Davis. James Walker led all scorers with 13 points for the Panthers. While the final score suggests a blowout, Willow Run was within four points of the Panthers with two minutes left in the third quarter. But turnovers and offensive inconsistency finally caught up to the Flyers (12-13). River Rouge (19-4) went on a 14-2 run over the last two minutes of the third and first minute of the fourth quarters to put the game away. In the final 10 minutes of the game, Willow Run was outscored 25-2, and in the second half managed only three field goals. Four different players led Willow Run with four points on the night. Davis said that nerves may have gotten the best of his team because they were so amped up for the contest. Numerous times throughout the game, Davis used timeouts to calm his team rather than to design plays he said. “I may have drawn something up on my (board) once. You know it was really just to tell them ‘slow down, it’s okay,’” said Davis. With the season over, Davis looked back on the tumultuous season as a sign of good things to come. After losing their coach halfway through the season, Davis was proud of the way his guys came together and worked in the final two months of the year. After spending only two months with the team as its head coach, Davis thinks the team could have done more, had he had more time to implement his own style. “We didn’t start playing man-to-man until the last three games of the season. There would have definitely been a difference,” Davis said. “I just think I can get more out of them than coach (George) Woods was able to.